Chances are, if you surf, and you surf Facebook, as well, then you’re friends with Surfin Swami. At last count, Surfin Swami had more than 4600 Facebook friends. To put that in perspective, I have 345 friends. Not that I’m anybody, but frankly, I’m not sure I even know 4600 people, let alone surfers. Funny thing is, HE sent me an invite! I was like, “Whoa!” Who is this guy? So I did a little digging, and what I found out touched my little heart. The Surfin Swami is, indeed, a swami, and as far as we know, the only swami that surfs, hence the name. He doesn’t smoke, drink or do drugs, but admits to having partaken in the past. He’s a vegan, and he runs the Ashram Surf Retreat, home of the INDIA Surf Club (aka-Mantra Surf Club) near Mangalore on the southwest coast of India. India! A population of 1.2 billion people, and they’ve got like twelve surfers in the whole country. 4500 miles of coastline and twenty-feet waves during the monsoon season! Talk about un-crowded surf! More research tells me that the INDIA Surf Club is “dedicated to the pastime of surfing, introducing surfing in India, and introducing India to the international surfing community.” They make sustenance by teaching web design and selling coconuts. I trace the origins of the ISC to 2006, founded by the Swami and another guy named Haridas Babaji. That’s weird. I actually recognize that name. He sent me a Facebook friend invite, as well. So I figure these two guys must have stumbled across one of my riveting articles, and somehow liked what they read. But, as I would come to find, the three of us actually have something in common. Surfin Swami’s real name is actually Jack Hebner, and Haridas Babaji is Rick Perry. Not only are they Americans; they both grew up, and were some of the first surfers in, of all places, Jacksonville Beach, Florida. My hometown. Now, here are two guys from my neck of the woods, authentic pioneers of surfing in North Florida, who are devoting their lives to spreading the heart and soul of surfing all the way on the other side of the globe. Recently, I caught up with both of them when they visited the Western Hemisphere on a mission to set up yet another surfing ashram in Mexico. MS: Tell me all about your Jacksonville Beach roots. Jack Hebner: It was the summer on my junior year in high school 1963. The family lived in Jacksonville, and weekends we would usually go up to Mayport, because my Dad was in the Navy. One weekend we went to Jacksonville Beach near the pier with another family. It was a typical summer Sunday afternoon, and I rented some guy’s board and caught some white water. The rented board was an old Hobie tandem board that had been broken in two and reshaped and fitted with a homemade fin. I got stoked, and he wanted to sell me the board. The guy was not a surfer, and we agreed on a price: $80. Next weekend, I came down and met the guy and gave him the money for his board. The board was a monster and weighed a ton. I went over to the right hand side of the pier and stepped into the local scene. I met guys like Bruce Clelland. George Knobbs, Ricky Luce, Ricky Hale, Bill Perry and his little brother Rick, who later became a lifetime friend. I soon learned that being a ‘weekend worrier’ was not where it was at, but there wasn’t much I could do about it, because I still had one more year of high school to finish. When the next year of school was out, I left home and moved to the beach. A bunch of us guys rented a house next to the pier, and we hung out all summer surfing and renting our boards to get money for food and rent. The place was a dump, and we ate like dogs, but we were surfing everyday, and in our world, at that time, nothing else mattered. That winter I got a job when the North Florida Surf Shop opened as a ding repair guy. Later I graduated to full on glassing and got a job with a new company that had set up a factory in town called Allen Surfboards. We started the Ocean Side Surf Club around that time, which was great, and the next year I headed out to California and Hawaii. I haven’t been back to surf Jax Beach since then. Rick Perry: My older brother Bill, Bruce Clelland, Ricky Hale, Mitch Kinsey, Ricky Luce, Surfin Swami Jack Hebner, George Knobbs and Bill Longnecker were the first ones I remember surfing at the pier. There were quite a few others, but those are the guys I remember most the first couple of years. They were the ones always out, the regulars. The old pier was basically my front yard. I was a few years younger than that gang, so I just kinda of followed them. I remember my older brother ranting how much fun it was. Then I had to do it too. The first year I borrowed boards, and then I got one, a Daytona Beach Surfboard, for Christmas. MS: What was the surf culture like in Jacksonville Beach in 1963? JH: The culture in 63-64 was surf, sun, girls, drinking beer and trying to keep away from the Draft. Ricky Luce signed up for Nam and was killed within weeks. That was a downer for all of us and cast a shadow of doubt over our thoughts about joining or getting drafted. In a word… party and surf was the surf culture of the 60s. RP: It was laid back. My older brother and his gang were the pioneers. I lived in a big old house just a block away from the Jacksonville Beach Pier, so everyone would leave their surfboards there. There wasn’t any theft at that time, either. I remember counting around 30 surfboards in the yard spread all over the place. When the older guys left their boards, they were all up for grabs. That’s how I started. People like Red Danner also started out that way. He was one of my best friends back in the day. Red And Bruce Clelland and Alvin Farmer were all in that neighborhood next to the pier, so we surfed quite a lot together. MS: How did learning to surf in Jacksonville Beach influence what you’re doing today? JH: I started off a long boarder and I’m still a long boarder today. We were there every day at sunrise at the Jax Beach pier for the morning glassy session, and I still prefer early morning sessions above all. I got the stoke for surfing when I was a kid at Jax Beach, and it provided me with a great start for what I still love today. RP: I was around 12 when I started. By the time I was 15 I was on a surf team. The members of that team were myself, Bruce Clelland, Larry Miniard, Joe and Vincent Roland, Red Danner, Mike Holtzinger, Bob Leonardo (Huntington Bch) and Kathy LaCroix. We toured up and down the east coast. It was the Allen Surf Team, one of the first teams in North Florida. After that I was hooked on traveling. After High School, I surfed Puerto Rico for a year or so. Then I was off to Hawaii, where I ended up living around 22 years, a couple of years on Oahu, and the rest of the time on Maui. Later I traveled to India and lived there around 8 years. MS: How did you meet Rick? JH: Usually, I saw Rick when he was a kid getting pushed out of the car when we were going somewhere, because there wasn’t space for him. He was often the odd man/kid out because he was a lot younger than the rest of us back in 63/64. He was only 12 or 13 years old and the bulk of us were 17 or18. But Rick and I later hooked up in Hawaii when Rick was an adult, and we have been friends ever since. MS: How did you meet Jack? RP: Jack was one of the first surfers at the Beach along with my older brother and that gang I mentioned earlier. He used to leave his board at my house and sometimes camp out in the yard or on the beach nearby to catch the early surf. We were both members of the beaches first surf club ‘Oceanside Surf Club’. It’s kind of a nice story because both of us after leaving the beach got into yoga. But we did not meet up again until 1996 on Maui, after 30 years or so. It was a chance meeting. He had an ashram in India and had been surfing there for years, so he invited me over. He is the father of surfing in India and is responsible for really getting it going there. Jack and Rick...still surfin' together nearly fifty years later. MS: When are you coming back to Jacksonville Beach? JH: Good question. I often think of surfing Jacksonville Beach again someday, but I haven’t been able to pin that day down just yet. RP: I hope soon. But now we are involved in Mexico and have a lot of work to do getting an ashram started, so I really can’t say when I will be there. JH: Thanks a million, Marion, for remembering me and surfing at Jacksonville Beach in the same thought. Have a good one. Mahalo and Namaste! I’m off to Mexico on Monday morning. A Dios Amigo!!!!!!! Mahalo and Namaste to you too, Jack. I hope to ride some waves with you and Rick one day! 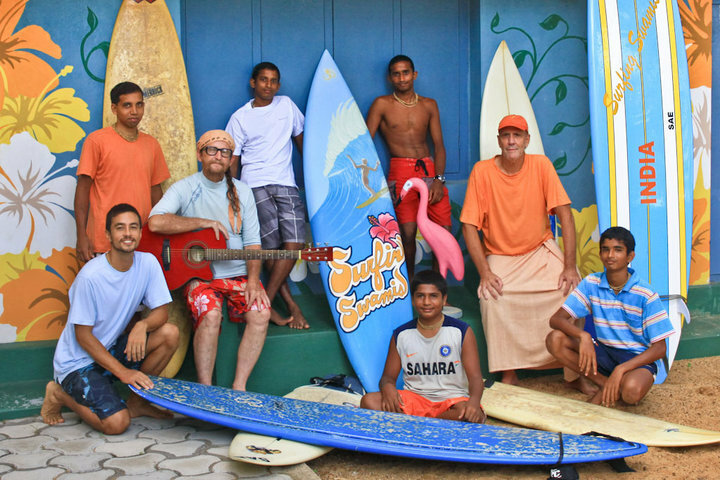 For more Information on the INDIA Surf Club and the Ashram Surf Retreat, visit their website. It is a small world. I was good friends with Jacks brother Scotty when our fathers were stationed at Roosey Roads, Puerto Rico. My father retired in Jax & I graduated from Forrest High School & lived at Jax Beach for a number of years. I found this article while searching for an old friend. She is Kathy Lacroix who I used to give rides to Jax Beach and surfed with in ’66 but lost touch with when I left for the Army. I heard she moved to back California and I have always wondered what happened to her. I Google her name from time to time just on the off chance. This message is for Boyd Emerson. For so many years, I tried to find you. Something made me google your name tonight and this is the article that came up. I was shocked to learn that this is really you. I would love to talk with you some day. Hope you are doing well. Marion, thanks for the great article. I am Boyd Emerson, the guy mentioned by George Nobbs in the comments. George and I were the first of the JB pier gang to head west. It was September 1964 and we landed in Mission Beach in San Diego. We got jobs, surfed all the local breaks and lived the life for a few years before we went in different directions. George started racing motorcycles and I started a career building boats.Thanks to you I am now back in touch with George and Jack after all these years. Jack and I, along with Mark Kizis, Butch Harris, Glenn Wiggins, Hal Thompson and a few others were actually from the west side and all went to Forrest HS. We were all members of Oceanside Surf Club,I designed the lettering and had the blue windbreakers made at Finkelstiens Sporting Goods in downtown Jax. The guys from the Beach were cool and let us townies in! I remember those days and all of the guys with great fondest and hope to see them again.